Carlin's Nicolai Kjaergaard converted his front row start into his fourth win of the year in a damp opening contest at Donington Park this afternoon. Kjaergaard got the jump on pole sitter and team mate Billy Monger, and then led the contest from lights to flag, and kept his cool under late pressure from fellow Carlin driver Jamie Caroline, who rose from sixth on the grid to claim second, with Krishnaraaj Mahadik taking the final podium spot in third. Monger claimed fourth, having fallen as far back as sixth at one point, with the British driver fending off a race-long battle with Lanan Racing's Kush Maini. Ayrton Simmons held a podium spot for Chris Dittmann Racing for much of the race, but dropped back to sixth by the chequered flag. Monger fought back from his early troubles to claim fourth. He began his fightback by passing Maldonado on lap six, and then claimed fourth when Simmons slipped back on the penultimate lap. Throughout, Monger was almost constantly fending off attention from Maini, celebrating his birthday today, with Monger only breaking clear of the battle in the final stages when he began to threaten for the podium again as Mahadik and Simmons fought for position. Maini settled for fifth in the end on his 18th birthday, having been as close as 0.116s to Monger, and was comfortably clear of Simmons, who seemed destined for the podium only to slip back on lap 11. 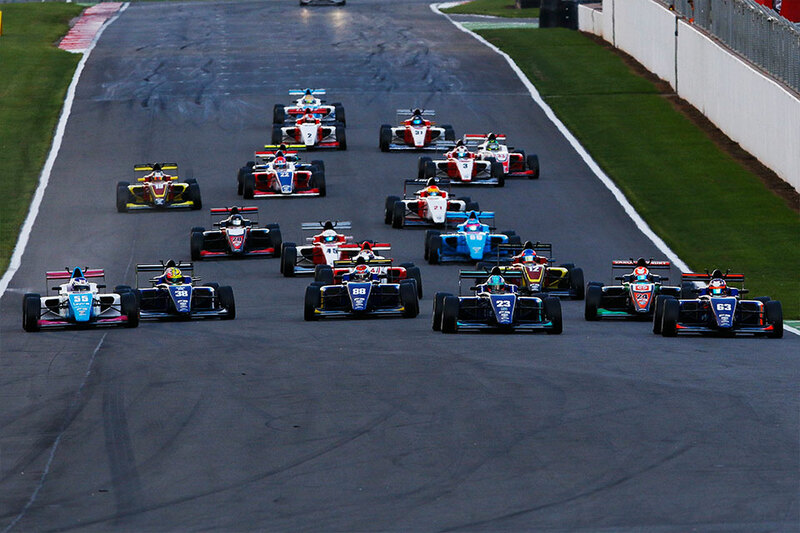 Carlin's Sun Yue Yang claimed his maiden BRDC British F3 win at Donington Park, converting his pole position and keeping a cool head in a chaotic race. There was drama right from the start, with the race red flagged after the initial start due to damage to the circuit, and ruining excellent starts for Gamble, who had climbed into the lead, and for championship leader Linus Lundqvist, who had climbed from 11th on the grid to third, while Manuel Maldonado retired with damage. With the race restarted with the original grid, it was Yang who led them away off the line, but further down the order there was chaos at Redgate. A spinning Arvin Esmaeili came back onto the track and impacted with Kush Maini and with Lundqvist, while Jusuf Owega was also caught up in the drama, with race one winner Kjaergaard having to take avoiding action in the process. Esmaeili, Maini, Lundqvist and Owega were all out on the spot, with this being Lundqvist's first retirement of the season, on a weekend where he could have sealed the championship.